I have to confess that I don’t always find it easy to simply ‘rest – to let go of everything – allowing my mind and body to be still. I find myself thinking about all the things there are to do – so – cut short that rest – get on with the next thing. 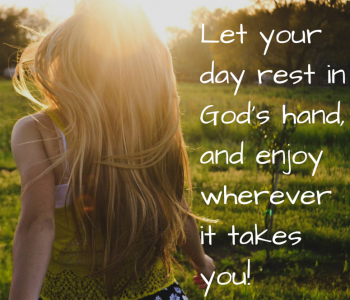 Rest is a ‘pause’ – a time out – from the busyness of life – and can be very meaningful – my soul is rested and refreshed as I sit in the quiet of the morning – as I rest – choosing not to be agitated or troubled – choosing to keep my mind focused – allow myself to contemplate the goodness of God – as I look at His creation set out before me. I have found though – that however much I might love these times of rest – I do have to ‘practice the art’ of quietening my mind and spirit. I’m reminded of a book – about a monk called Brother Lawrence – called ‘The Practice of the Presence of God’ – it speaks of his life – how even in the middle of mundane tasks – he focused his mind – shut out everything else – and connected with God – his was a mind in perfect peace with God – a rest of his soul.